President Trump held a campaign rally for U.S. Rep. Lou Barletta in Wilkes-Barre on Thursday night. 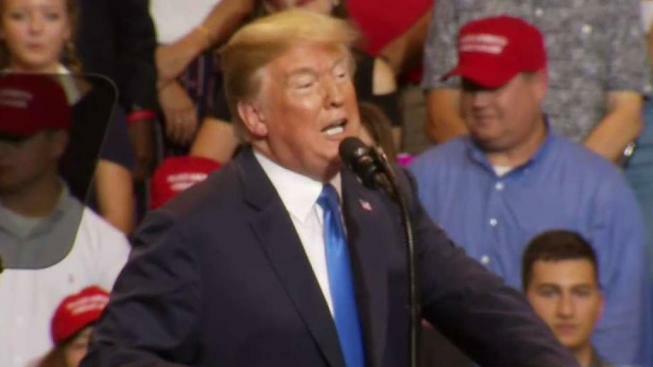 President Trump held a Make America Great Again rally in Wilkes-Barre on Thursday night and took some shots at U.S. Senator Bob Casey. 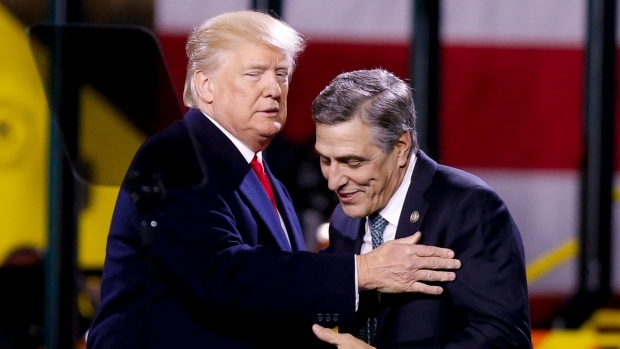 U.S. Rep. Lou Barletta, the Republican challenger to incumbent Bob Casey in Pennsylvania's U.S. Senate race, has long been glued to the hip of President Donald Trump. He was, after all, the tough-liner on illegal immigration — as mayor of Hazleton, a town northwest of Allentown — long before Trump took national politics by storm. "Barletta is glued to the hip of Trump," Franklin & Marshall College pollster Terry Madonna said. "He was Trump before Trump was Trump." "On virtually everything, he's a Trump guy," Madonna added of Barletta's policy stances. That's why so much depended on Trump's visit Thursday night to Wilkes-Barre, Luzerne County, jumpstarting Barletta's sagging campaign. The Republican trails by double digits in recent polls. In fact, the average of three tallied by RealClearPolitics shows Barletta trailing by 16 points to the two-term Democrat. President Donald Trump, left, greets Rep. Lou Barletta (R-Pa.) before a speech at H&K Equipment Co. on Thursday, Jan. 18, 2018, in Coraopolis, Pennsylvania. Casey also held a 6-to-1 advantage in campaign cash-on-hand, according to the most recent federal reports filed June 30. Casey had roughly $10 million to Barletta's $1.5 million. But Republican strategist Charlie Gerow said an overhaul of Barletta's campaign staff about a month ago, along with Trump's rally, could very well create some momentum for the next few months leading up to the November midterms. "He's starting to find his footing. Frankly, his campaign was a little slow getting on track," Gerow said. "The new leadership (for his campaign) has it figured out." Still, Gerow acknowledged Barletta faces an uphill battle to make up so much ground and increase name recognition in a state that Trump won in the 2016 presidential election. His campaign is doubling down on the tough immigration policies that Barletta first popularized as a mayor well over a decade ago. "Radical politicians like Bob Casey are sabotaging efforts by law enforcement to keep our families and communities safe from crime," Barletta campaign press secretary David Jackson said in a statement. "Bob Casey must answer to the victims of criminals released onto the street in sanctuary cities who commit heinous crimes against innocent Americans." Trump arrived in Wilkes-Barre, which is 20 miles from Hazleton, for a 7 p.m. rally at Mohegan Sun Arena at Casey Plaza, 255 Highland Park Blvd. Attendance was general admission. Doors opened at 4 p.m. Crowds began lining up hours before the rally.